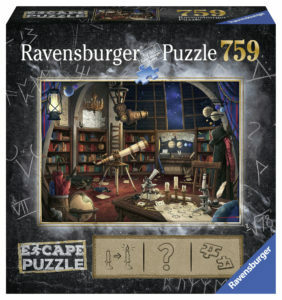 Ravensburger introduces a first-of-its-kind Escape Puzzle series. This brand-new jigsaw puzzle category combines the fun of puzzling and thrill of an “escape the room”-style game. After solving a 759-piece puzzle, players race to find the hidden riddles, solve the mystery and plot their escape piece-by-piece. The Escape Puzzles are perfect for social gatherings where you can work together with friends or family to puzzle your way out. Choose from four fun themes: Space Observatory, Vampire’s Castle, Submarine or Witch’s Kitchen.